I am proud to be working Farmhouse Chicago! I'm excited to work with this wildly successful Midwestern tavern in River North (which has been getting great reviews across the board on Yelp and Open Table, by the way… check ‘em out! ), not just because of their success, but mostly because they stand by keeping everything local. I’ve always been a fan of Farmhouse’s whimsical and smartly irreverent brand design, and I am excited to be taking the reins in cultivating the brand look from this point forward, while working with the ever-amazing El-Be Social Marketing, who does a fabulous job on the social media and web development front. 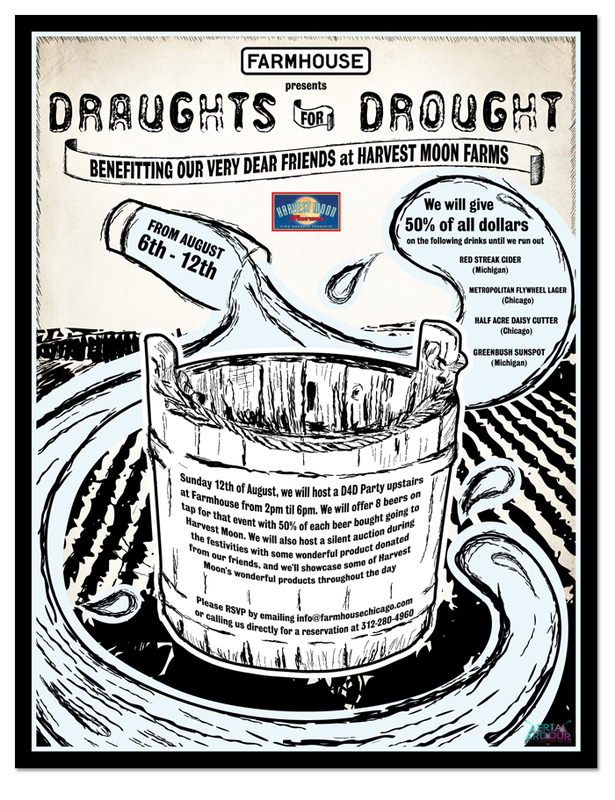 From August 6 to the 12th, Farmhouse took 50% of the dollars from a select list of local beers and donated it to Harvest Moon Farms. With the terrible drought this summer, our local farmers could really use the support. When I first heard the idea from Farmhouse owner and general manager Ferdia Doherty, I thought, “Of COURSE he thought of a way to have a good time for a good cause.” He’s always been one one to do that. So I wanted to find a design concept that would come close to doing justice to the event idea. As my husband and I were driving to get some really good sushi over one weekend, BAM! I got an image of a beer glass pouring beer-turning-into-water into an old farm water bucket, so I quickly started sketching. It’s a ridiculously literal idea, but it quickly and boldly communicates what the promo is about. I then followed that design up with another that focused more on the D4D party on the 12th. For the look and feel, I wanted to retain the wonderful textured look that Farmhouse already has, but I also wanted to give it a breath of fresh air. I feel pretty great about accomplishing that here, and I hope to continue to achieve a comfortable familiarity yet freshness with the rest of the Farmhouse projects from this point on. I hope you came out to support the cause! Awesome giddiness alert: Even Stephanie Izard – Top Chef Season 4 winner and owner of Girl & the Goat – came out… and she even tweeted a pic of my design!! Then I dorked out, squealed in delight (and in the process startled my Boston Terrier, Angel), and tweeted about it out of unbridled excitement. :D!!! And if you couldn’t come out, that’s okay. 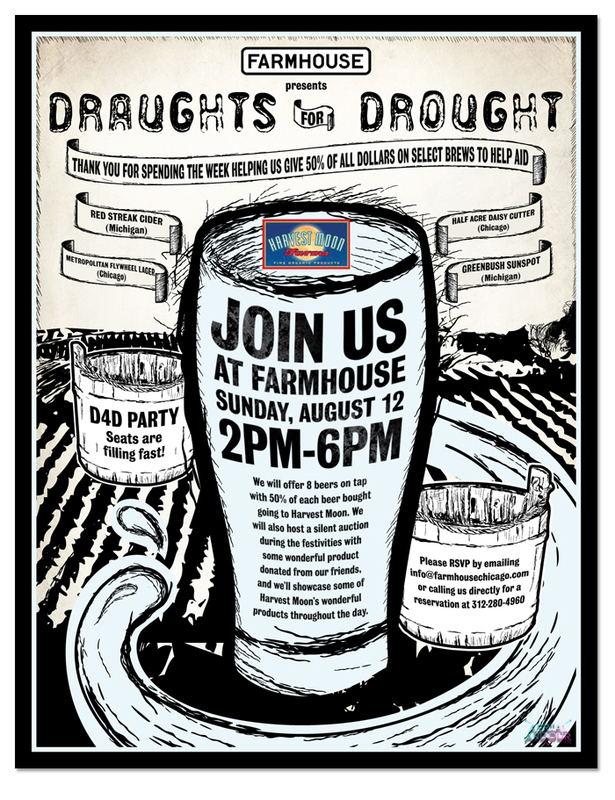 With Farmhouse always willing to step up and help a neighbor, no doubt you’ll get the chance to enjoy a brew for a good cause again soon.